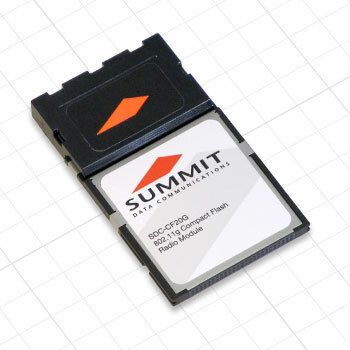 The SDC-CF20G provides all key Summit brand hardware and software capabilities in a Compact Flash form factor. As a result, the SDC-CF20G is ideal for integration into application specific devices like portable data terminals, portable printers and medical devices. ETSI: 13 (3 non-overlapping). FCC: 11 (3 non-overlapping). MIC: 14 (4 non-overlapping). Transmit: 440 mA (1320mW). Receive:180 mA (594mW). Standby:10 mA (33 mW).